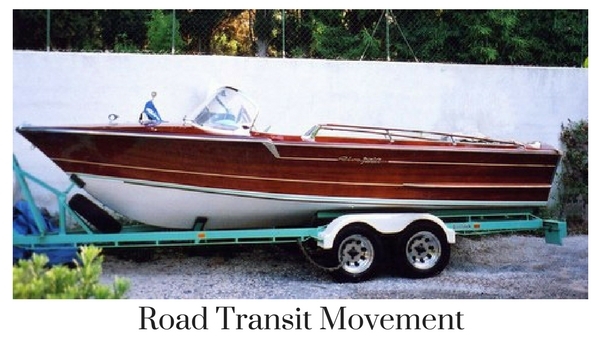 If you are towing your own vessel by road you should check both your yacht and motor insurances. Your yacht insurance policy will not cover your liabilities to third parties during any part of the movement by road, so these liabilities must be insured by your motor insurance provider. Often yacht insurances will also exclude minor damage such as scratching or denting and the policy excess may also be increased during the course of the tow. Read your insurance policies carefully and double check with your insurance company or broker if you are not sure. Insurance becomes a little more complex when a professional haulier is engaged to move the vessel by road. Generally a haulier will only have insurance to cover his own legal liabilities in respect of his negligence and his insurance will not be on an ‘all risks’ basis. If damage occurs not as a result of his negligence, then his insurance will not respond to any claim. In addition, the haulier’s insurance and/or the terms & conditions of the towing contract (usually Road Haulage Association or Freight Haulage Association terms) will very likely limit liability which is usually determined by a rate to weight calculation. Just to confuse matters a haulier’s insurance policy may show liability limits well in excess of the vessel’s value so you would think the vessel is covered but it matters not if liability is capped by RHA, FHA or CMR terms. Liability is capped at £1,300 per tonne. In addition, consequential loss and any other indirect costs in the event of a claim are limited to the cost of carriage unless there is something in writing between you and the haulier. A haulier transporting a yacht of say 15 tonnes and worth £175,000 would therefore cap his liability at £1,300 x 15 = £19,500 so a potential gap in cover of £155,500 exists. On the Continent goods are moved under CMR conditions (Convention on the Contract for the International Carriage of Goods by Road) which in effect cap liability at c.£8 per kilo of weight carried. Using the example above, for the same yacht the liability cap would be calculated as £8 x 15,000 = £120,000, a potential gap in cover therefore of £55,000. Be aware that having your yacht moved by road significant gaps in insurance cover may exist either due to damage arising not as a result of the haulier’s negligence or, if the haulier is responsible for the damage, the cap on his liability. This gap can prove costly, particularly if the vessel being transported is a high value/light displacement yacht. Check your own insurances as it may be that road transit risks are covered in any event but be sure to check the haulier’s insurance details as well and pay attention to the terms & conditions referred to in the haulage contract. Consider additional cover, for example a quotation for marine cargo insurance, or investigate options for either extending your own yacht insurance policy or, and it is often a cheaper alternative, request the haulier extends his own insurance to ‘all risks’ with no cap on liability. We are happy to review the insurance arrangements for any proposed road movement. Note: The British International Freight Association publishes regular updates on the limits of liability.